In Reitz, Free State, South Africa, 39-year-old Danie Slabbert believes that the focus of agriculture should be on the welfare of the next generation. 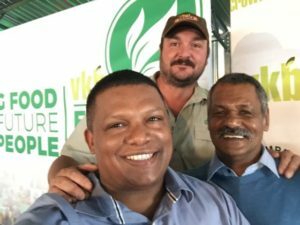 This is the main reason why Slabbert farms “regeneratively,” to ensure both the survival and prosperity of the South African farmer. Slabbert says he’s saddened when he thinks that agriculture over the past 200 years has been very degenerative. Danie Slabbert (rear) with TV host Ivor Price and former Springbok coach Pieter de Villiers. “Agriculture has broken down, with chemicals and tools. We’ve actually weakened the land without even knowing it. What we want to do, is bring it back to its natural state,” he explained. “A few aspects of farming changed completely. It’s a whole new challenge. For example, we don’t work the land, no ploughing, nothing. No farming operations. The only operation process is when we plant,” he added. He’s been practicing regenerative agriculture for some 11 years, and has seen the structure of his land restored, along with its ability to retain water. Featured photo (by JMK via Wikipedia) shows a Free State farm at Cornelia in the Riemland region. See full article by Dawn Noemdoe in Food For Mzansi.